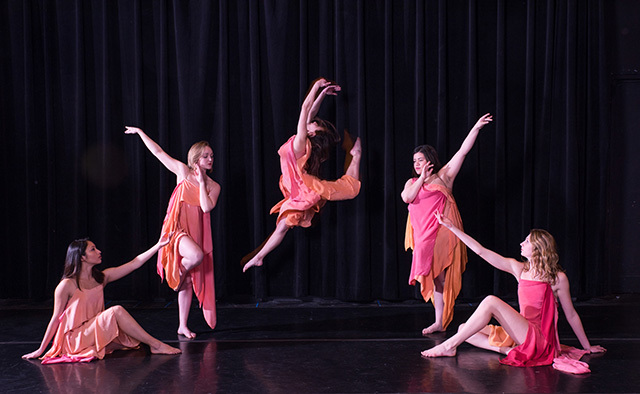 The Theatre, Film and Dance Department at Humboldt State University presents _Luminescence_, an original dance concert created by students and faculty, in the Van Duzer Theatre on campus for two weekends in April. “Luminescence” comes to the Van Duzer Theatre on April 6 and continues April 7, 8, 13, 14 and 15 at 7:30 p.m. There will be one matinee performance beginning at 2 p.m. on Sunday, April 16. Choreographer Austin Silavong explains that his dance “Reveries of Youth” was “inspired by the HSU children’s center philosophy of learning through social play. “I knew I wanted to work with one dancer and focus on innocence, joy, personal growth, and development. The dance takes place in a day dream of childhood memories.” Austin is a Cellular-Molecular Biology major with minors in Child Development and Dance. Jessie Rawson choreographs “Jet Set” in the style of musical theatre. “Jet Set is a fun and sassy musical theater piece about the luxuries and joys that come with traveling the world for a living,” says Rawson. Sharon Butcher, associate professor of dance, oversees the production. Butcher holds an MFA in performance and choreography. She has been an active member of the American College Dance Association having served as master teacher, lecturer, regional representative, and as a member of the board of the directors. Her choreography has been performed in various places in the United States as well as in England, Scotland and Spain. In addition to functioning as artistic director of Luminescence, Butcher is teacher/mentor of a dance production class where she guides students through all facets of producing this dance concert. Students work together on costuming, publicity, and fundraising in addition to the creation and rehearsal of the dances. Butcher explains that is a great experience for students: “They envision, create, choreograph/compose, and stage their dances. They coordinate, teach, coach and direct their cast members.” Butcher also choreographs one of the dances in the show. All in all, there are nine student choreographers, two faculty choreographers, 11 dances and over 50 dancers. The dancers are mostly students but also include community members and alumnae of the Dance Studies Program. Don’t miss this fascinating, creative and original performance. The production opens in the Van Duzer Theatre on April 6 and continues April 7, 8, 13, 14 and 15 at 7:30 p.m. There will be one matinee performance beginning at 2 p.m. on Sunday, April 16. The performance on Saturday April 15 will include a silent auction fundraiser in the Theatre lobby. General admission is $10. Students and Seniors are $8. HSU students are admitted for free with student ID. Parking is free on weekends. For tickets, please call 707-826-3928. For more information, call the HSU Theatre, Film and Dance Department at 707-826-3566.